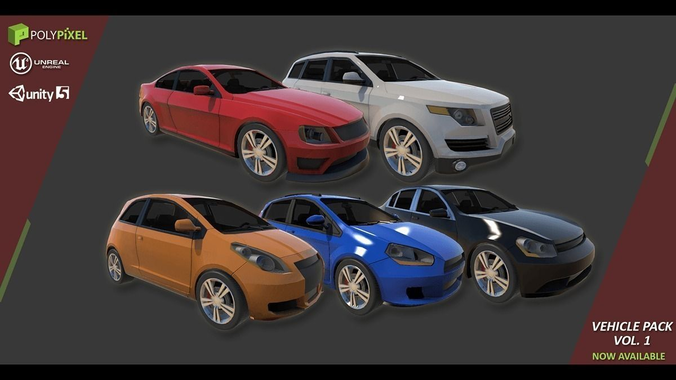 Vehicle Pack Vol.1 contains 5 completely custom designed vehicles ranging from SUVs, Sedans and compact hatchbacks. The quality rivals matches the video game industry standards on current-gen consoles. Each car comes in 3 versions, a rigged version, a standard prop model, and a version equipped with moveable doors, hoods, and trunks. The cars are built using Substance Designer giving you full control of the textures, and we also provide the SBSAR files so you can customize the look even further. The texture scale is entirely up to your discretion, with the Substances giving you control of the resolution in game. The cars also come with full LODs so whether your platform is Desktop or mobile, these cars can be fitted into just about any game type and platform. There is no Unreal content in here as illustrated in the video. Can I get a Market Place Voucher to get the vehicle blueprints. I will rate positive after receiving what was advertised.